Have you ever been watching a YouTube video on a Mac and wished you could send it to your Apple TV to view on a bigger screen? You can do exactly that with the help of AirPlay and the latest versions of Mac OS X, which make sending a YouTube video from the Mac to an Apple TV as simple as a few clicks. 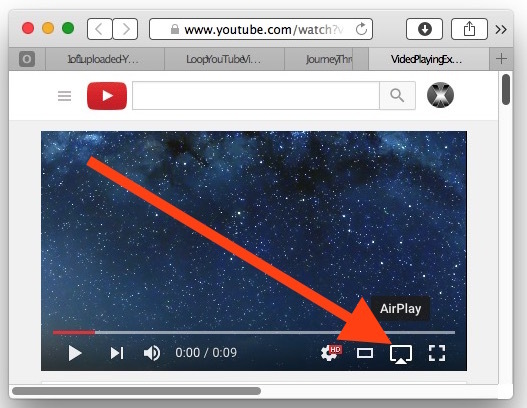 In order to AirPlay a YouTube video from the Mac to an Apple TV, you’ll need the following; an Apple TV (3rd generation or later) connected to a TV, a Mac with OS X El Capitan or newer, both the Mac and Apple TV must be on the same wi-fi network, and you’ll need to use Safari. The rest is incredibly simple, as you’ll see in this tutorial. Mac users with an Apple TV can wirelessly transmit YouTube videos from the computer over to their TV with the help of AirPlay. The YouTube video will start playing on the Apple TV, and the YouTube video on the Mac will turn gray with a message stating “This video is playing on [Apple TV name]” to indicate what and where its’ playing. 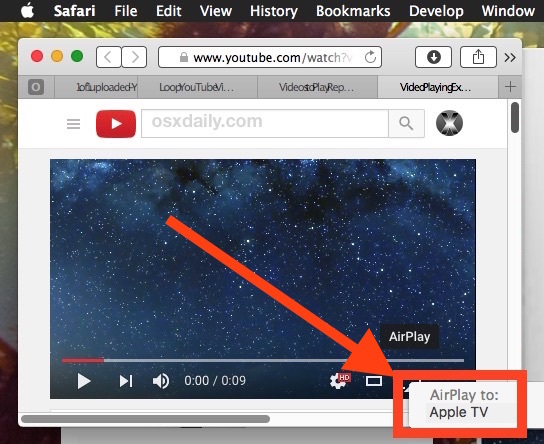 Going beyond YouTube, AirPlay is quite versatile, you can use AirPlay to mirror a Mac screen wirelessly to an Apple TV, and you can AirPlay a video from QuickTime on the Mac too, which is great for locally stored videos and movies that you want to watch on the Apple TV equipped television as well. The ease of the feature is really one of the more compelling reasons to get an Apple TV for many Mac users. For Mac users who like this idea but don’t have an Apple TV to stream to, you can easily connect a Mac to a TV with HDMI, and while it’s a wired connection (best served with a long HDMI cable), it works flawlessly, has full audio and video support, and is also remarkably easy to setup. I tried this and no airplay icon was present. Is this an El Capitán only feature? 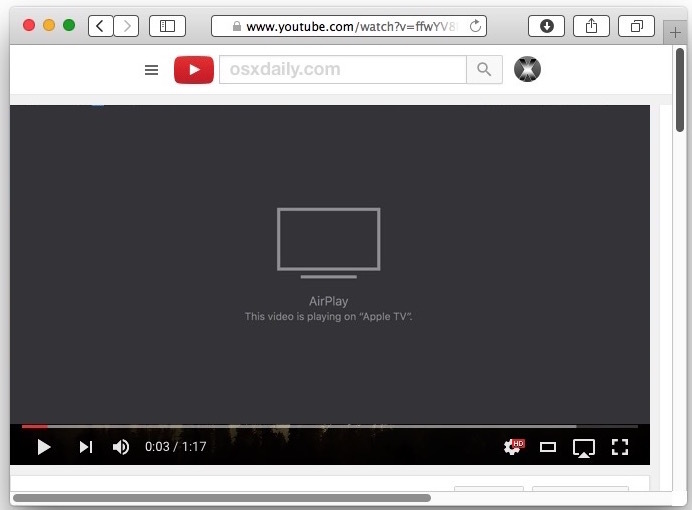 Yes, AirPlay from YouTube requires that you must use Safari with a recent version of MacOS X (10.11 or newer). I am a little surprised it is not supported in Chrome given YouTube is a Alphabet/Google product, but maybe Apple doesn’t allow that. Oh but Chrome users CAN use the Chromecast, which is $35 and works perfect for streaming wireless video from Chrome to a TV. You also can stream YouTube to a Samsung wireless tv right from your iPad or iPhone while using the YouTube app by clicking the wireless symbol in the upper right corner of the video. No AirPlay needed! Also, you will need a Mac that is mid-2011 or newer. It actually works fine on my early 2008 Mac Pro. I was surprised that the icon was even there when El Cap came out. channel. No need for a computer..
exactly my thought. this is going to be the long way around most times. Yes you can watch YouTube on Apple TV, Xbox One, PS4, many smart TV, that’s not the point. The point here is if you’re on a Mac (say a laptop on the couch) and you want to beam the YouTUbe video on your screen to the TV, you can do that easily. I surprised this is an El Cap feature, not a Safari feature. I have problem with playing YouTube from Airplay on Mac to Apple TV. Sometime it works and sometime won’t work with slow connection or disconnect from Airplay. Note: I use EI Capitban on my Mac and Apple TV 3rd. 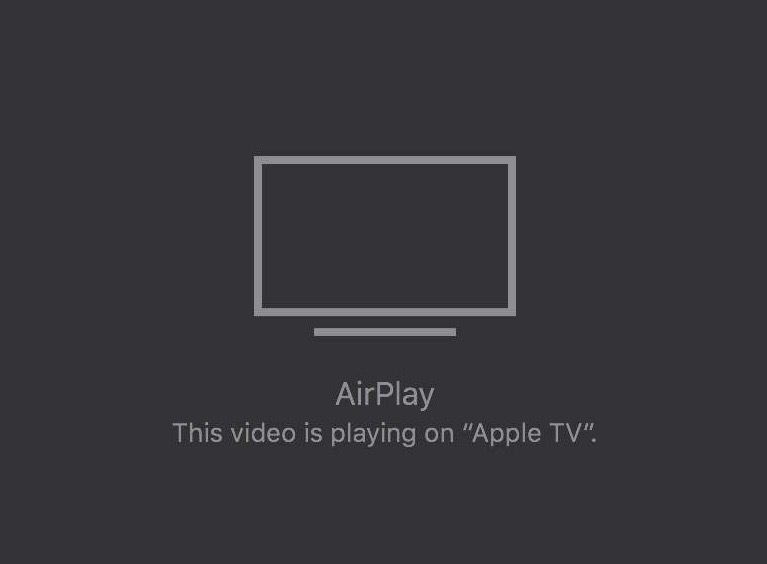 Is this different from the normal airplay feature? Generally find airplay to be unsatisfactory; too many small glitches, missed frames etc. I’m totally frustrated and wondering if anybody can help…. I have used Airplay successfully over the past few months for playing audio files, although it sometimes needed repeated toggling to work. Now however, Airport won’t operate at all. In System Preferences > Sound, I select Airport. Same in Audio MIDI Setup. But the sound keeps coming out of my Macbook Pro speakers. What stupid thing am I doing wrong or missing? I wish it was a whole lot simpler. I am on OSX 10.11.6. I try to Airplay YouTube videos to Apple TV with Elmedia Player. This is actually a player with Airplay support. So, you open the necessary video in this player, than click AirPlay icon in the control panel and select Apple TV.